Quick Pinnacle Sports Review: The best NHL sportsbook for non USA players! They have the best hockey betting odds online. Ever been to Craigslist? The online classifieds site looks like it could have been designed by a two-year-old. It’s all text, no images, with a white background. Yet Craigslist is one of the most successful websites in the world. Pinnacle Sports is the Craigslist of online sportsbooks. They don’t have any glitzy graphics to dazzle your eye. There isn’t a Pinnacle Sports signup bonus or any free plays. They don’t feature live chat or telephone support either. Check out www.pinnaclesports.com and you’ll see what we mean. But when it comes to the top NHL sportsbooks, Pinnacle is like Craigslist is to online classifieds — an industry leader that you can’t afford to ignore. How does Pinnacle Sports do it? Simple: the best NHL betting odds. They consistently have the best odds on the NHL and pretty much any other sport you can imagine. Did you know? You’ll make an extra $5 on every $110 bet you win at Pinnacle Sports compared to other sportsbooks that offer standard -110 odds? Over time, it’ll add up to far more than any signup bonus you could receive at other NHL sportsbooks. Pinnacle Sports betting limits are very high and along with their lightning-fast payouts they are a top choice among bigger, sharp bettors. The rest of this Pinnacle Sports review will go over other aspects of the sportsbook which matter to NHL bettors. There’s no Pinnacle Sports signup bonus, no free plays, no freebies at all. It’s as if their logo should be Uncle Scrooge. But there’s a very good reason for that. Pinnacle Sportsbook is an incredibly efficient operation. By eliminating expenses like bonuses, a flashy interface, live customer service and even advertising, Pinnacle Sports doesn’t need as much revenue to be profitable. So they pass those savings on to you. Instead of paying +105 on an underdog like some online sportsbooks might, Pinnacle Sports would offer +110. Instead of making you lay -110 on an over/under bet, Pinnacle Sports will offer -105 odds. This translates into more money for every bet you win – an advantage no sign up bonus can match. As we mentioned earlier, Pinnacle Sports customer service doesn’t feature telephone support or live chat. By keeping their overhead costs down, they’re able to offer the best odds instead. However, they do offer email support. And we can’t believe how quickly they get back to our emails — usually within minutes. We hear from them faster than we hear from our wives for leaving the seat up. If you’re withdrawing money, you can expect to have the cash in your account within 30 minutes. That’s the fastest withdrawal process we’ve seen in the online sportsbooks industry. It wasn’t too long ago that Pinnacle Sports mobile betting was one of the sportsbook’s biggest knocks. It was actually easier to use the full version of the Pinnacle Sports website on your phone than to try to use the Pinnacle Sports mobile app. But Pinnacle has come a long way in developing its mobile betting. Their mobile site now offers almost everything you’ll find on the full site — including parlays, which their mobile site didn’t allow in the past. NHL betting at Pinnacle Sports can be done as easily on their mobile site as on their full site. Best NHL Odds = More Money For You! 1. No Bonuses: If you’re a small player just starting out you may want to grab a big signup bonus like 100% at Bet365 in order to quickly grow your bankroll. 2. Not As Many Features: There are more “fun” sportsbooks to bet NHL at than Pinnacle Sports. 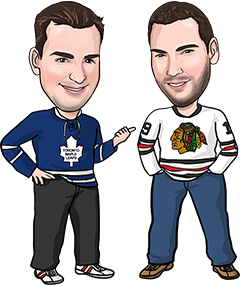 They won’t offer you game previews or NHL betting news on their site, they don’t have very many NHL props, and their NHL live betting is only during intermissions. If you’re more interested in having as much fun as possible betting NHL and not worried about trying to maximize profits, you’re better off betting at a sportsbook like Bodog. 3. 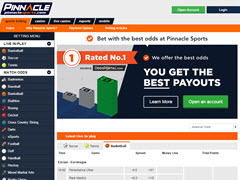 Can Only Bet Online: Finally, if you want to phone in your bets you can’t do that with Pinnacle Sports – they only accept bets through the website. Those are really the only 3 reasons we can think of to not recommend Pinnacle Sports. Pinnacle Sports doesn’t accept US Players. Americans should check out BetOnline instead. Pinnacle Sports is the best NHL sportsbook for most bettors and is usually the first sportsbook we recommend to players (unless you live in the United States or you simply need to have a signup bonus).